What a delightfully baby card. 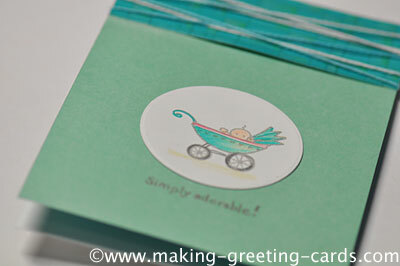 A whimsical baby in a pram against a white background and layered with teal coloured card stock. I don't know who produced this rubber stamp but it's a really cool image and I like the simple pram design and the innocent look of the baby looking out from the pram. It's a wooden rubber stamp and the image on the wood is a reverse image so I guess it must be produced cheaply. There's no manufacturer's details on the wood. 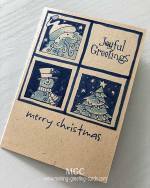 Actually only after I have created the card, photographed and attached to this page before I really scrutinised the image. Then I realised that there's a border of tiny hearts on the pram. Anyway, here's the image of this baby greeting card. Have a look! What do you think? Isn't that so cute? A baby onboard a pram. Drive carefully! So so cute!!! And the teal and white coloured yarns make this card so uniquely whimsical. I love it! I think I'm going to make more of this card design using other sweet colours. So anyone going to have a baby soon? Shout out in the comment section below and I might send you one if I hear your shout. How's that? Colour card stocks are from Provo Craft - 6" x 12" Textured Dual-Tone Cardstock. white color cardstock 4.25" x 6.5"
light teal color card stock 4.25" x 6.00"
dark teal color card stock 4.25" x 1.75"
Apply glue or double-sided tape and attach light teal color cardstock to folded strip of the white card for card front. Ink background rubber stamp with gray ink and stamp on dark teal color card stock. 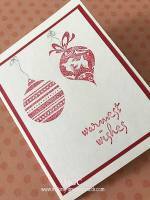 Use a white color pencil to color alternate rectangles on the stamped background. Tie the cotton a few times around the strip of dark teal cardstock. 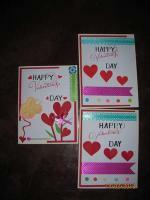 Attached to top of card front with double-sided tape. Punch or die cut a 2.25" circle with the off-white scrap card. Ink pram and baby stamp with gray and stamp the image on the white circle. Colour image with prismacolor pencils. 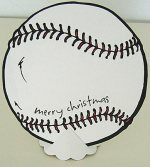 Attach to centre front of card.. Ink word 'Simply Adorable!' stamp with gray ink and stamp below the punched circle. The grey ink on the words 'Simply Adorable' was not sharp so I wrote over it with a silver fine marker. And with that, the baby card is completed and ready for a handwritten message inside. 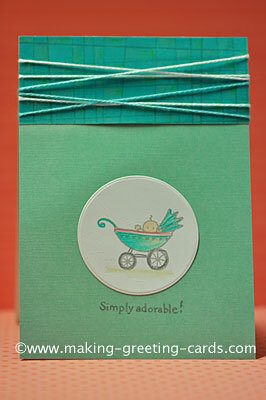 And here's another photo of the cute baby card. If you want to look at some birthday cards, just head over to my birthday card website for more inspiration. Adorable Baby in Pram. Be careful!